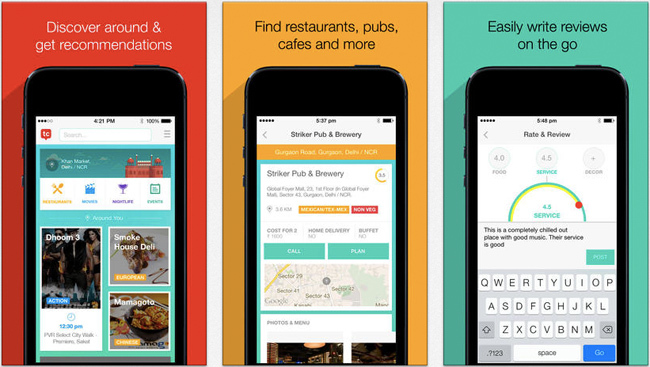 Online nightlife and restaurant guide TimesCity, part of Times Internet Ltd, has launched a revamped version of its Android and iOS apps. According to the company, the updated apps will enable consumers to discover the best restaurants, movies, events and nightlife in their city. Based on the popular Times Food Guide and Times Nightlife Guide, TimesCity is a comprehensive guide on food, nightlife, movies and event options in your city. It features reviews and ratings from a panel of food critics and foodies, latest movie trailers, reviews and theatre listings. Note that the TimesCity had acquired location-based restaurant recommendation app Gawbl for an undisclosed amount in August this year. Gawbl was developed four months ago by a Pune-based team, led by Chiragh Kirpalani. Post the acquisition, Kirpalani joined TimesCity as head of mobile, while his team also became part of TimesCity. "It's a quick, easy and smart location-based app with the most relevant and updated information on what's happening in your city. With the launch of this app, we are providing users with a comprehensive lens into how to log off and have a good time," said Miten Sampat, business head, TimesCity. In order to use the app, you can either allow it to detect your location automatically, or choose the same manually by selecting the city and locality. It is currently available in 11 cities—Delhi/NCR, Mumbai, Kolkata, Hyderabad, Bangalore, Chennai, Pune, Ahmedabad, Jaipur, Chandigarh and Goa. Once selected, the app showcases popular restaurants, movies (along with the hall and show timings), nightlife and events happening around you. The app features listings and recommendations based on location, type of event, and must-try and must-do things in and around where users are. You can either sign up (via Facebook or Google+) or start accessing the app directly. Users can search and filter based on their preference of distance, ratings and price. In addition, it also shows what's hot (could be a restaurant & lounge, club or an event, etc.) and what's trending (from individual dishes to a particular movie). Users can also read featured posts from the TimesCity blog directly from the app. The app also displays a number of 'Yes' and 'No' questions, which users can answer to enhance their app browsing experience (by personalising the same according to the answers provided by the user). For example, we answered 'Yes' when asked whether we like drinking, and were shown 'quick and easy Rum recipes'. While separate sections are provided for restaurants, movies, nightlife and events, users can also search for a particular movie/event etc. We tried searching for a current movie, and were shown information like its rating, genre, language, critic review, starring/director, synopsis, trailer and duration. Detailed information on the halls it is playing in, along with show timings and distance from the user's location was also provided. In comparison, the restaurant section provides information on restaurants like their ratings & reviews, cost for two, cuisine, address, menu & photos, and their location on a map. You can also search for directions to (redirects to the Google Maps app for the same), or contact (via call) a particular restaurant via the app. Similarly, the nightlife and events section provides detailed information on clubs/bars, and currently happening & upcoming events. A 'Plan' button has also been provided, which basically shares the information via WhatsApp, Facebook, SMS or email with other users, allowing you to plan the movie / event etc. with them. Takeaway: A colourful app that provides a lot of contextual information. We especially liked the picture heavy user interface, although it can take a little time getting used to. iOS rating: The latest version is yet to receive any reviews; however, the average review for all earlier versions is 4/5.